Numerous recent studies have shown that concomitant carcinoma in situ (CIS) can be closely associated with the prognosis of patients with bladder cancer (BCa). However, the prognostic value of CIS in BCa is still not conclusive. Hence, we performed a systematic review and meta-analysis to explore the association between CIS and clinicopathological features and the prognostic value for BCa following radical cystectomy. We performed this study in accordance with the Preferred Reporting Items for Systematic Reviews and Meta-Analyses guidelines. Relevant studies were systematically collected from PubMed, EMBASE, and Web of Science, with an expiration date of August 2018. Hazard ratios and 95% confidence intervals (CIs) were pooled to assess the intensity of association. All data were analyzed by Stata 12.0. Moreover, heterogeneity and publication bias were determined, and sensitivity analysis was performed to examine whether the findings of the meta-analysis were robust. A total of 18,845 patients from 24 studies were included in the analysis. Our results indicated that CIS has no significant correlation with cancer-specific mortality (CSM) (pooled HR = 0.97, 95% CI 0.93–1.00, p = 0.059), overall mortality (OM) (pooled HR = 0.93, 95% CI 0.85–1.01, p = 0.076), overall survival (OS) (pooled HR = 1.04, 95% CI 0.96–1.12, p = 0.386), cancer-specific survival (CSS) (pooled HR = 1.06, 95% CI 0.97–1.16, p = 0.186), recurrence-free survival (RFS) (HR = 1.05, 95% CI 0.99–1.11, p = 0.098) or recurrence (pooled HR = 1.04, 95% CI 0.98–1.11, p = 0.212) in BCa patients. In addition, CIS was not correlated with gender (male vs. female, OR = 1.00, 95% CI 0.74–1.34, p = 0.978), pathological stage (III/IV vs. I/II: OR = 0.74, 95% CI 0.50–1.10, p = 0.132), tumor grade (1/2 vs. 3: OR = 3.38, 95% CI 0.73–15.65, p = 0.119), soft tissue surgical margin (STSM) (+ vs. − : OR = 1.20, 95% CI 0.97–1.48, p = 0.093) or lymphovascular invasion (LVI) (+ vs. − : OR = 0.92, 95% CI 0.62–1.38, p = 0.702),but was closely related to adjuvant chemotherapy (ACT) (yes vs. no, OR = 1.17, 95% CI 1.03–1.32, p = 0.019). Furthermore, these findings were demonstrated to be reliable by our sensitivity and subgroup analysis. The prognostic value of CIS in BCa remains inconclusive in patients submitted to RC. Our data indicated that CIS may have no significant correlation with the prognosis and clinicopathological parameters of BCa patients, and also may not be applied to risk stratification or individualized therapy in BCa patients. Further research should be conducted to confirm our findings. Bin Wu, Zhenlei Zha and Hu Zhao contributed equally to this work. The online version of this article ( https://doi.org/10.1007/s00345-019-02738-2) contains supplementary material, which is available to authorized users. Conceptualization: LZ, BW. Literature search: ZZ, HZ. Data analysis: JY, YJ. Writing—original draft: LZ. Writing—review and editing: BW. All authors approved the final manuscript. No funding was received for our study. We declare that there have been no potential competing interests in this research. 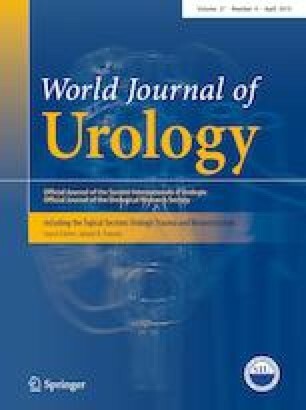 I give my consent for information about my relative circle to be published in World Journal of Urology. I understand that the information will be published without my relative’s (circle as appropriate) name attached, but that full anonymity cannot be guaranteed. I understand that the text and any pictures or videos published in the article will be freely available on the internet and may be seen by the general public. The pictures, videos and text may also appear on other websites or in print, may be translated into other languages or used for commercial purposes. I have been offered the opportunity to read the manuscript.